Fine white Mongolian cashmere, this the finest of cashmere fibres we stock. 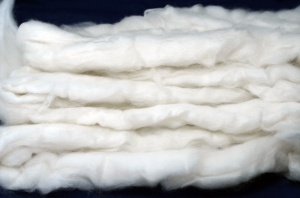 A very fine good quality white fibre, the softest you will find. Will spin into the finest of yarns. Cashmere is produced by hand combing the goats to obtain the fine undercoat. This still contains coarse guard hairs which are then removed by a de-hairing process. Originally this was done by hand but is now carried out on specialist carding like machinery. The machines reduce the guard hairs to less than 1% so you should'nt find any ! This whole process combined by the number of goats available to comb results in the high price of the best white good length cashmere. Because of the rarity and value of the fibre you will see inferior qualities being sold at lower prices or even being passed off as the best quality. One trick is to blend with fine wool or cotton. It is a buyer beware situation. We only work with reputable merchants/producers to ensure we maintain the high standard.